Outsourcing services in schools is a growing trend across the nation. Schools are identifying ways to save money and one of the first things outsourced is custodial services. For example, a study performed by Troy University in Alabama unveiled that Alabama schools are spending nearly 20% of their budget on food service, transportation, operations, and maintenance. 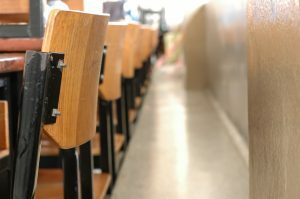 Michigan schools are leading the change by hiring private companies for food service and custodial tasks. These transitions can result in thousands of dollars to improve the education experience without sacrificing quality. For instance, Gaylord and Hastings School Districts in Michigan have saved $100,000 each in their first year of outsourcing custodial tasks. Even with its strong union presence, Michigan schools have been successful shifting these key services, and if it can be done there, there’s no reason it can’t be done here in South Carolina. The reasons for hiring private janitorial businesses to perform custodial tasks are endless. Contracting this work allows for flexibility in cleaning. There is no need to provide a certain number of hours or pay benefits as you would a full-time employee. Our custodians perform the tasks efficiently and thoroughly. There is no need to store and manage large inventories of cleaning supplies and equipment, we will handle that for you so you can worry about what is important, teaching and guiding the children of our community. We currently provide services for colleges in Greenville, SC, handling custodial tasks necessary to keep the college running smoothly and at a high level of cleanliness and quality. We believe in meeting and exceeding standards set by our clients. We pride ourselves in attention to detail that is second to none. We have experienced custodians who clean sensitive areas, such as medical locations, so we are comfortable cleaning areas where it is critical to prevent germs from growing and spreading, such as k-12 schools. We are a local business who has achieved a high enough level of customer service to keep our business strong and growing for over 20 years. We perform extensive background checks and pay higher than our competitors to ensure that our employees are of the highest caliber. Our employees understand the necessary balance between performing the highest quality of work and doing it efficiently, all while being sure that customer service comes first. We provide service availability around-the-clock so that we can work with your schedules at your convenience. We can be contracted one day to seven days a week and you will receive consistently excellent work every time. Our services are customized by need and location, some of the services we typically offer include: vacuuming all carpeted surfaces, emptying trash receptacles and replacing with fresh liners, dusting all surfaces and furniture, cleaning and disinfecting bathrooms, refilling bathroom supplies (toilet tissue, paper towels, soap, etc. ), cleaning glass surfaces, sweeping and mopping non-carpeted floors, etc. We customize cleaning needs to cover what each individual business needs. We are a local company eager to serve our community and if the Greenville area schools decide to hire professional companies for their janitorial services, we are ready, willing and able.